N.C. Sen. Josh Stein, Raleigh, N.C. The Jamie Kirk Hahn Ally Award is lasting tribute to a hero of Equality taken too soon. This inaugural acknowledgement of Jamie's extraordinary pro-equality work, named posthumously in her honor, is awarded to an North Carolina LGBT ally for the ages. N.C. Rep. Tricia Cotham, Matthews, N.C. The annual Equality NC Foundation Legislative Leadership Award recognizes exemplar pro-equality leadership in the North Carolina General Assembly. The Bob Page Equality Champion Award - named for a visionary leader in North Carolina's LGBT movement - honors a legacy of advocacy for LGBT North Carolinians. Freedom Center for Social Justice, Charlotte, N.C. 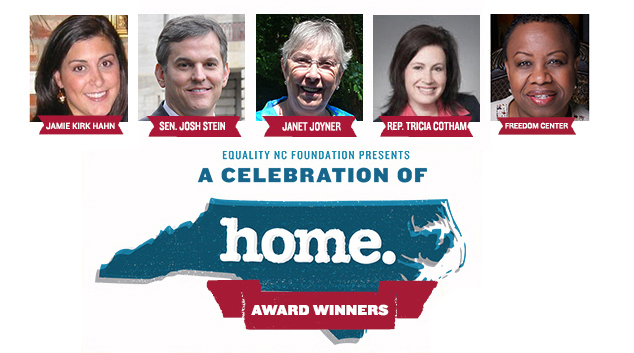 This inaugural award recognizes an extraordinary North Carolina organization doing groundbreaking work for LGBT citizens. For more information about the awards and recipients, visit: http://equalityncfoundation.org/gala/2013awards. The awards will be presented at the 2013 Equality NC Foundation Gala on Saturday, November 9, in downtown Greensboro (Empire Room, 203 S Elm St., Greensboro, NC 27401.) Registration details for the 2013 Equality NC Foundation Gala is available at: http://equalityncfoundation.org/gala.